Lake Mead is a harbinger of drought for the west. "Like a giant measuring stick in the desert, the dropping water level of Lake Mead, the nation's largest man-made reservoir, provides a vivid representation of the drought that is gripping the Southwest and much of the West," USA Today recently reported. The lake is in bad shape. "Now at 39 percent of capacity, [it] has been dropping since 2012, according to U.S. Bureau of Reclamation data, as much of the western U.S. has suffered the most serious drought in decades. The shortfall is endangering water supplies to the residents and 43 million annual visitors to the driest metropolitan area in the country," Bloomberg reported. Why does it matter? The significance of the hardship at Lake Mead is that low water levels at the lake mean the Colorado River "is running out of water," 8 News Now reported. "That's a big problem for the millions of people who live in the Southwest. 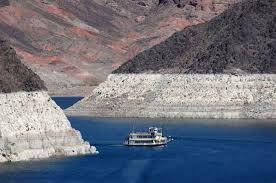 Lake Mead, which is fed by the river, is now at its lowest level since the Hoover Dam was built almost 80 years ago." The Colorado River is key to economic wellbeing in the West. It "contributes $2.8 billion for Nevada every year. It supports 17,000 jobs and quenches the thirst of 2.5 million Nevadans and it remains in serious danger," the report said. Lake Mead was constructed during the Great Depression, according to the report. It gathers up "water that falls as snow on the Rocky Mountains as far north as Wyoming and collects in the Colorado River," the report said. It is a water source for parts of California, Las Vegas, and Arizona. The situation is likely to get worse before it gets better. "Officials of the U.S. Bureau of Reclamation's offices here, who control the river flow and distribution of water within legal guidelines, expect Lake Mead's level to decline a bit more before recovering some as water held further upstream in Lake Powell is released," the USA Today reported.